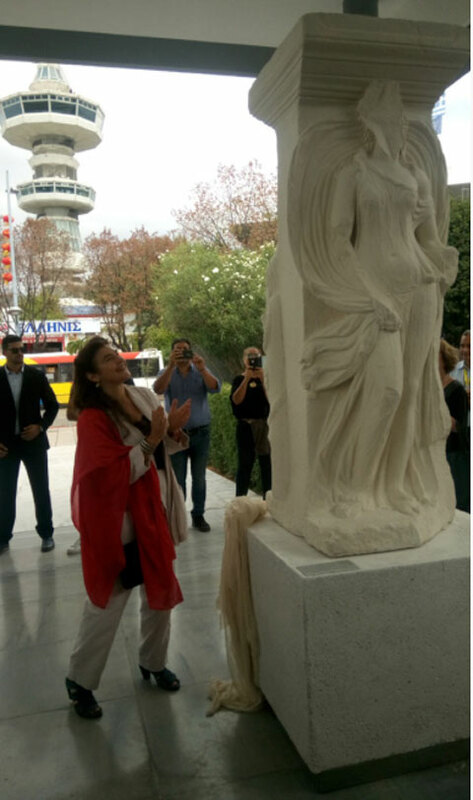 Lydia Koniordou, Minister of Culture and Sports, during the opening of the permanent exhibition ‟Las Incantadas/ The Enchanted Ones; A fairytale monument” (photo: Ministry of Culture). On Saturday, September 9th 2017, the permanent exhibition “Las Incantadas/ The Enchanted Ones; A fairytale monument” was opened at the Archaeological Museum of Thessaloniki by Lydia Koniordou, Minister of Culture and Sports. In the portico of the Archaeological Museum of Thessaloniki, the city’s residents and its visitors will finally be able to admire the exact replicas of the Incantadas or Enchanted Ones, as these two sided pillars are commonly known, from the monument of the Portico of Idols, transported to the Louvre Museum in 1864 and returned to Thessaloniki as exact replicas in September 2015. The relinquishment of the moulds by the French “is a unique event”, as the Minister of Culture pointed out. Inaugural speeches were made by Yannis Boutaris, Mayor of Thessaloniki, Anastasios Tzikas, President of the Thessaloniki International Fair HELEXPO and Apostolos Tzitzikostas, Regional Governor of Central Macedonia. Among those present were Maria Andreadaki-Vlazaki, Secretary General of the Ministry of Culture and Sports, Voula Patoulidou, Regional vice Governor of the Metropolitan Unit of Thessaloniki, the Head of the Minister of Culture’s Office, Deputy Mayors of Thessaloniki, representative bodies and a large crowd. On Friday, Ms. Koniordou inspected the Ancient Theatre of Thasos. A serious amount of reconstruction work was achieved through the Ministry of Culture’s restoration programme of 2013-2015. “The inclusion of the Theatre of Thasos in the new NSRF funded by 3,500,000 Euros, will allow for the implementation of the approved studies and enable the reopening of this monument, which is directly linked to the Philippi-Thasos Festival and to the social, cultural and tourist life of the island,” stated the Minister. While there, Ms Koniordou attended the opening event of the 10th General Meeting of the “Diazoma” Association, at the Ancient Theatre of Thasos. Finally, during her stay in Thessaloniki, the Minister of Culture and Sports had a series of meetings with representatives of the supervised bodies of the Ministry of Culture and Sports.